Natural gas vehicles provide significant air quality benefits. Compared with other transportation fuels, natural gas creates minimal SOx, NOx, mercury and particulate emissions. Natural gas trucks and buses reduce both smog-related emissions as well as toxic emissions that can affect human health. During vehicle refueling, there are no evaporative emissions as the connection between the fuel dispenser and the vehicle creates a sealed system. Highway tractors that operate on liquefied natural gas (LNG) incorporate boil-off capture systems, so that if LNG starts to warm up and return to a gaseous state, the fuel is captured and stored on the vehicle. Natural gas vehicles can reduce greenhouse gas (GHG) pollution by up to between 10 and 25 per cent. A recent study by ICF International shows that by converting heavy duty vehicles to natural gas, Canada could reduce GHG emissions by approximately 25 per cent by 2030. Emissions from older engines can be reduced with a properly configured conversion kit. Fleets that operate natural gas vehicles can offer a lower emission service to their customers and reduce the environmental impact of their operations. Light, medium and heavy duty vehicles are ideally suited for natural gas because of the significant air quality benefits provided by this fuel and the ease of refuelling it offers for return-to-base fleets. Nationally, transportation is the second highest source of greenhouse gas emissions (GHG) at 28 per cent, while in six provinces it is the largest source of these emissions. Since 1990, overall transportation GHG emissions have consistently outpaced total GHG emissions growth. When it comes to medium and heavy duty vehicles, and off road diesel vehicles these emissions have grown, rising from one quarter of the total to more than two thirds the total. Light duty trucks have also increased their contribution to transportation emissions, rising to almost one quarter the light duty vehicle total. Domestic marine and rail are also emissions intensive vehicles. By switching to natural gas, these modes of transportation can achieve significant GHG emissions reduction. Much like on road diesel, there are a small number of these vehicles in Canada, operating along defined routes, and have only recently begun to be subject to significant emissions reductions regulations. Two emissions initiatives are impacting the Canadian marine industry. The first is the implementation of the North American Environmental Control Area which has specific provisions under MARPOL Annex VI. These regulations limit a variety of emissions, including NOx, SOx, particulate and GHG emissions. More broadly MARPOL outlines a basis for reducing GHG emissions for marine vessels, through vessel design changes as well as vessel energy management changes. Natural gas as a marine fuel has a distinct advantage as a lower emitting fuel, in terms of NOx, SOx and particulate as well as life cycle GHG emissions reductions. Vehicles fueled by natural gas can also use renewable natural gas (RNG). RNG fuel is 100 per cent renewable and can offer additional environmental benefits of using what would otherwise be a wasted resource. 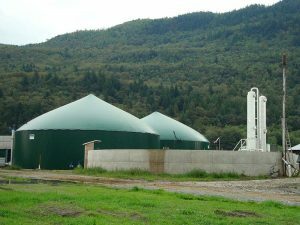 RNG is natural gas sourced from landfills, waste water treatment plants, agricultural waste, forest residue and other biomass. Like any other natural gas supply, once it is processed, RNG can be converted to CNG or LNG. RNG can be blended with other natural gas supplies (like ethanol is blended into gasoline) or used as the primary supply.